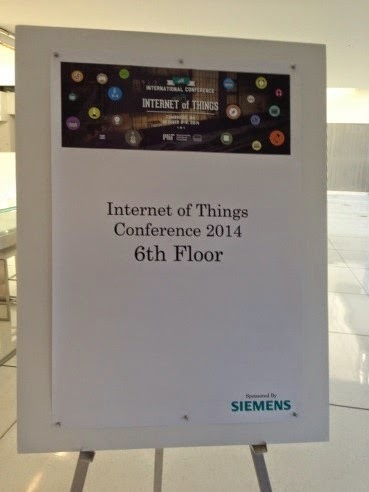 IoT2014 is the continuation of IoT2008 (Zurich), IoT2010 (Tokyo), IoT2012 (Wuxi). This conference focuses on both academia and industry, it applies a rigorous review process to research papers (according to IEEE guidelines), features focused workshops on IoT subtopics as well as demo and poster session presenting early ideas. The audience comprises a rather unique set of researchers, consultants, end-users, funding agency representatives and entrepreneurs. 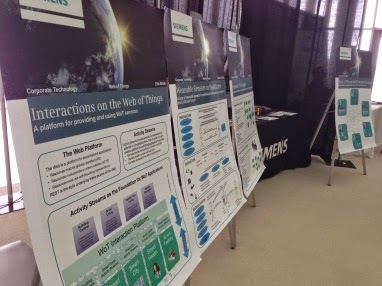 Siemens’ Web of things research team has been the this year’s gold sponsor. 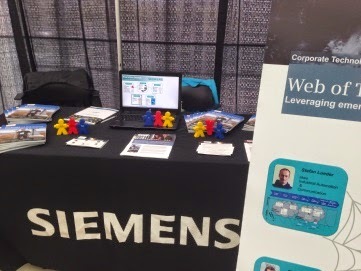 This yielded an honorary mention of Siemens in the opening of the conference, a keynote speech (presented by K. Bettenhausen), sponsor booth and appearance on print material. 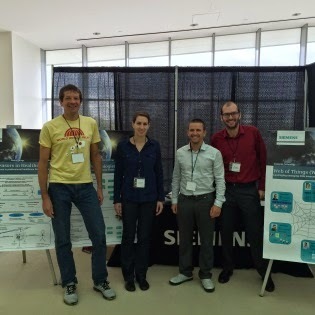 Additionally, team members of WoT were visible beyond by organizing the web of things workshop and various talks. 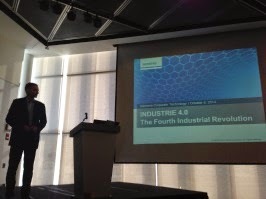 The keynote of Kurt Bettenhausen (Siemens) highlighted the economic importance of manufacturing industry across the world. He expressed the need for innovation in order to keep up with the pace of innovation coming from China. 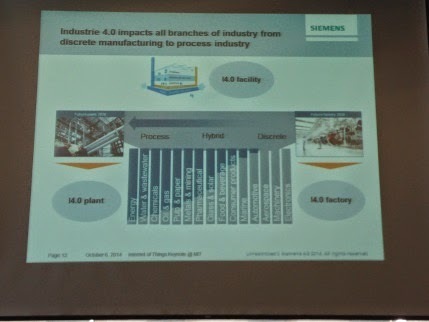 Thus, in Germany the vision of Industrie 4.0 has been created which suggests products carrying all the data throughout the production process describing the steps for the product necessary to get produced. The driver for this vision are individual customer needs, dynamic design of engineer, new services, increased efficiency, and the importance of work-life balance of workers. After the lost battle in internet technologies, software and mobile services, it’s the European industries’ chance to make Industrie 4.0 a reality. This should allow companies to gain more flexibility in manufacturing control, reduction of energy and shorter time to market. In addition to the efforts and opportunities of big data analytics, there is much more knowledge available locally during the production process already which should be leveraged: why re-learning constraints from data analytics as they were already know during the design process. Questions from the audience focused on the performance of the Industrie 4.0 project progress in Germany and explicit examples of I4.0. The keynote speaker mentioned successful collaboration between research, industry and government but was not willing to disclose specific examples of I4.0. If you build an ugly system, everybody says how ugly it is, if you build a well-defined system, nobody will ever look at it. 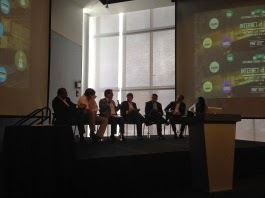 An IoT panel discussion has been lead by Alex Ilic from the Auto-ID Labs. The keypoints raised by the panelists Sanjay Sarma (MIT), Elgar Fleisch (ETH Zurich/HSG) and Scott Jenson (Google) were interesting and diverse. The Internet of Things should develop successfully in specific verticals first and then only derive generic principles for cross domain platforms. This would counter the “European” approach of EU-funded projects which have spend time and money on developing bullet proof and shiny solutions which have a hard time of adoption in any domain. There was, however, no consensus which approach would succeed, at least the Internet has followed build-it/fix-it approach;). History of industry has shown that whenever a dominant design  has evolved, the industry became successful. For the IoT we are still missing this dominant design, who could lead this effort, IT players, or verticals? Finally, healthcare was mentioned to bear the greatest potential for IoT, as here it is not just about money but about a huge societal problem. Healthcare is so expensive today and differences between developed and developing world are tremendous. IoT would have the potential to link information and devices, provide access, empower people, drive costs, and challenge expensive equipment, e.g. MRI’s, with simpler sensors embedded in connected billions of phones. 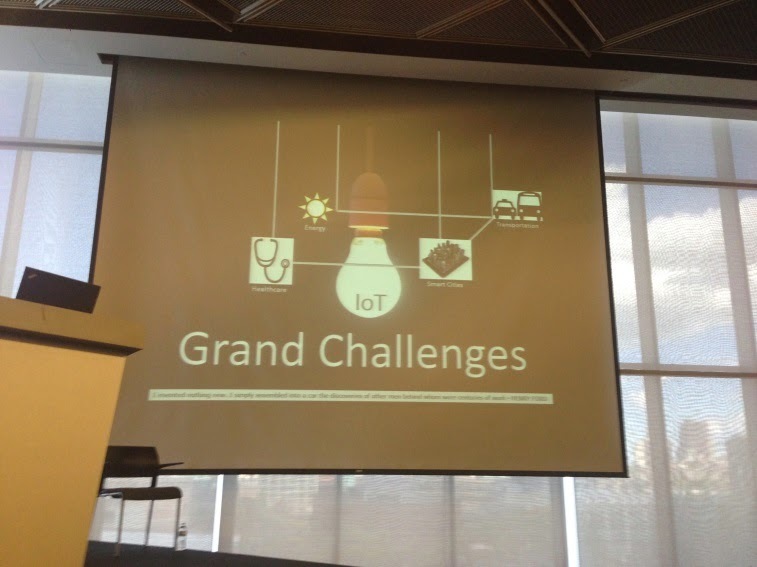 Shouman Datta (MIT) built upon the argument of the previous panel discussion that IoT should not be just about money but even more about societal challenges. The grand challenge would be to build a platform that creates an ecosystem for other to follow. The vision of the IoT would be rather old anyway. 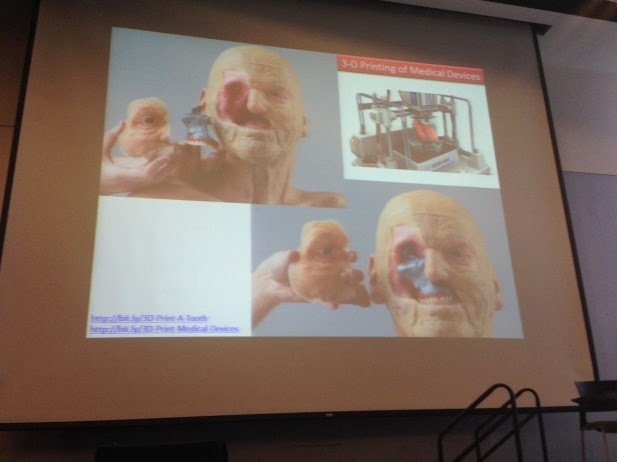 Shouman mentioned projects like ‘pay per pee’, monitoring at the toilet, odd projects like ‘print your face’ and others. The ultimate potential for IoT in healthcare will be to connect a plethora of dumb disconnected device of today, increase patient safety and increase building a more comprehensive understanding what’s going in the human body for longer periods of time. Mastering the Dynamics of Innovation, Utterback (1994) Harvard Business School Press ISBN 0-87584-342-5 Library call numbers HD58.8.U87 1994 658.4’06—dc20, p 24.